I have heard of mayonnaise made with cooked yolks before, but was suspicious of it. Now a user posted another question with a link to a recipe which shows the making steps. It shows the making a mayonnaise with a hard boiled yolk, emulsifying 150 ml of oil with a single yolk (and as far as I can tell, no additional liquid - the text is in Romanian). The mayonnaise in the picture looks nicely emulsified and smooth. How is boiled-yolk-mayo made? What is the best ratio? Should I follow a different method than with raw yolk? How different is the result from normal mayonnaise? Actually in Romania people tend not to use raw yolks so much. Most often we eat relatively raw yolks just in fried eggs or soft boiled eggs. In most of recipes the yolks are cooked. Regarding mayonnaise there are three ways of preparing it: using just raw yolks (most simple), using raw and cooked yolks 50-50, and using just cooked yolks (harder). For the last one, which helps storing mayonnaise safer and longer, the eggs are well boiled and then the yolk is removed. After cooling done until lukewarm it is finely crushed (often by passing it through a sieve several times) and then oil is added little by little. Sometime a small quantity of soft mustard is added for creating more chance of success. For one yolk about 100 ml oil can be incorporated (depending yolk size, as well). The mayo resulting it is slight harder then regular one. For making it softer, if you would like, you can add at last bubbled water (like a teaspoon), some lemon juice and even a tablespoon of cream or yogurt. Enjoy! Pofta buna!! PS: we have some recipes of mayo without yolks, at all. These are for the period when we traditionally fast and no animal product is allowed. It's not an emulsion if there's not a liquid other than oil in the recipe. An emulsion is, by definition, a combination of two immiscible liquids such that droplets of one (the dispersed phase) are suspended in and surrounded by the other (the continuous phase). I don't read Romanian either, but there's got to be some sort of non-oil liquid in there, like vinegar, wine, water, or lemon juice. I've heard of making mayo with cooked egg yolks. Harold McGee gives a recipe in On Food and Cooking for mayo made with yolks heated enough to pasteurize (or something close to it) but not completely cooked. Julia Child describes a technique for mayo and Hollandaise that involves cooking an egg with water and flour (I'd guess to keep the cooked egg smooth); see The Way to Cook, pg. 377. She says it "tastes just like the real thing," and claims that it's less susceptible to spoiling in warm weather. The pictures you linked show a food processor, and it's a good bet that the high speed of the processor helps to break up the hard boiled yolk and make for a somewhat smooth sauce. It'd probably help to give the processor a head start if you crumble/mash the yolk with a fork first. I would like to contribute though unfortunately I have no source material besides my own experience. I have come to this question from a search for what to call a sauce made from cooked egg yolk, water, and oil since most definitions of mayonnaise define it as an emulsion from raw eggs. You can make an emulsion using cooked yolk. I use the yolks from hard boiled eggs to make mine. I use a plain hand whisk for the mixing, adding oil and water a little at a time. I often use soy sauce as part of the water component. I remember the first attempt I was concerned when it seemed to have come together to a point but still had a grainy appearance when it finally crossed over that invisible line and turned into a creamy emulsion that looked and felt as smooth as any store-bought mayo. I went ahead and tried it. 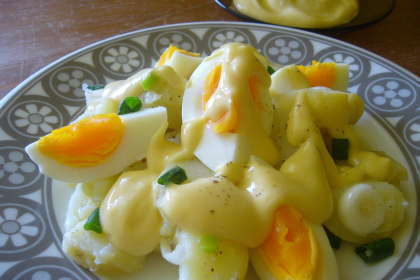 I used hard-boiled yolks, as a soft and slimy one would be not really different from making the mayo in a waterbath. It turned out to be incredibly fickle. The first try, only yolk and oil, with immersion blender, split immediately and never recovered. The second try was supposed to incorporate the bad emulsion. I first made a paste from the yolk with a few milliliters of lemon juice and water, then started adding the bad emulsion, beating with a mixer this time. I got a thick suspension of yolk particles in oil, but it wasn't emulsified. I don't know how the emulsion in the picture is made, maybe the sources I have heard of forget to mention that the yolk shouldn't be hard boiled (mine was longer boiled than the one in the forum picture). If this is the case, then obviously there is nothing unusual happening here - the yolk retains some of its emulsifying power even after boiling (I suppose it is the lecithine), but many of the substances which are actively helping the emulsion when heated around 70°C don't work any more. So, working with cooked yolks is possible, but much harder than the normal heated raw yolks. Which makes me think that there is no reason to try further to use cooked yolks. I can't comment on taste, didn't try the emulsion before it split. After splitting, the yolk-containing oil is still usable as a bread dip, but doesn't taste well enough to be made on purpose. If you are asking because you are concerned about safety...placing whole eggs in a water bath and maintaining them at 57 degrees Celsius for two hours with an immersion circulator will yield safe, pasteurized, eggs. When cracked and separated, the yolks behave essentially as raw. Proceed with mayo. Look up sauce gribiche, If you leave out the pickle juice and use hard boiled egg, oil, lemon juice and mustard you have mayo. Not the answer you're looking for? Browse other questions tagged eggs mayonnaise emulsion yolk or ask your own question. After you bake eggplant, is it fine to not drain the water? How do I make mayonnaise split? What do you call eggs prepared with a broken yolk, in a skillet, with no char?